You’ve achieved a measure of success in life. You’re poised to explore new horizons, discover new purpose and experience personal growth. But if you’re reading this page, perhaps you sense that something is holding you back, preventing you from achieving your full potential. Perhaps you’re not managing stress as well as you need to and it’s beginning to impact your career. If you work in a competitive, stressful environment, you may often be faced with solving complex problems and implementing difficult changes for your team or organization. Perhaps you’re also having trouble juggling your daily career responsibilities with your personal life and you often find yourself wondering whether it really is possible to “have it all.” Maybe you’ve even been on that same treadmill for many years, trying to make it all work, find balance, ever seeking “a better way.” Devotion to work is admirable, but it’s easy to become single-minded and let that devotion muddy your priorities. Do you find it hard to make time for you, to simply unplug and unwind? Has it become harder and harder to appreciate and enjoy the fruits of your labor, to simply relax and enjoy the present? Whether you’re an employee or an entrepreneur, it’s easy to caught up in that cycle of ruminating about past mistakes and worrying about the future. Meditation can help you balance your life and clarify your priorities. Sahaja meditation’s built-in therapeutic process functions, in part, as a mirror for self-reflection — a powerful mechanism for self-improvement and personal growth. You’ll develop a deeper understanding of the universe and your place in it. Through Sahaja meditation, we achieve cognitive clarity, which enhances our problem-solving and decision-making skills, and sparks creativity and innovation when seeking solutions. Sahaja helps build your inner confidence and release any fears associated with uncertainty, ambiguity or unpredictable results. You’ll find that you’re better able to manage change dynamically and with confidence. Your communication skills and ability to empathize with others improves, thus relationships with colleagues improve. Now, maybe you’ve been telling yourself that you’re “too busy” to learn how to meditate. But you don’t have to go away to a monastery or spend hours a day meditating to receive the benefits. Just a few minutes of meditation a day can restore and recharge your mind and body, clarify your priorities, improve productivity and decision-making ability, and prepare you to cope with every deadline or difficult business decision that comes your way. You’re a busy executive in a competitive environment who must manage daily staff grievances and business challenges, while keeping in mind the organization’s big picture and maintaining clarity, focus and priorities. You’re stuck in a routine, dead-end job that doesn’t allow you to realize your full potential and could use a creativity boost to make that breakthrough career move, or help you blaze a new career path altogether. You like your job and chosen career path, but often face challenging problems that, if you could effectively resolve them, have the potential to make you more successful. You’re both a busy professional and a busy parent who often finds it hard to juggle work, family and household responsibilities on a daily basis and could use a little help fitting all the pieces together smoothly. You’re good at your job, but you have interpersonal problems with some of your co-workers and would like to improve your relationship and teamwork skills. You’re a boss who can’t seem to inspire or connect with the people who work for you and would like to develop the personal qualities that would increase your charm, popularity and emotional resonance with others. More often than not, you work too-long days and you’d like to have greater focus and productivity at work so that you could leave work on time and reclaim that time for moneymaking side ventures or just relaxing and enjoying your life. With an increase in energy comes an increased desire to actively pursue your professional goals. Sahaja meditation acts as a natural energy recharge and replenishment mechanism that automatically helps regenerate interest and motivation to perform work. Meditation improves our ability to “bounce back from tiredness quickly” and “take shorter recharge breaks.” We can work longer and smarter. Meditation has been found to increase levels of the neurotransmitter dopamine and increase meditators’ ability to focus attention on the present moment (Kjaer et al., 2002). Dopamine is the primary neurotransmitter involved in regulating attentional systems and motivational drives (reward-motivation neural circuitry). Dopamine enhances learning, memory and the flow of information in frontal brain regions linked to thought and emotion. Dopamine is also involved in the release of natural feel-good endorphins, which act as natural mood lifters and have a calming effect on us. It is associated with feelings of joy, pleasure and reward; in fact, one study found that meditation increased dopamine by as much as 65 percent in limbic (emotional) brain regions (Lou et al., 1999). Deep introspection through Sahaja meditation techniques has been found to shift corporate managers’ psychological traits, personal values, and “guiding principles” (Zollo, M., Berchicci, V., 2007). Because Sahaja improves self-awareness and introspectiveness, you’ll have live and constant feedback of what’s going on with your mind and body. This powerful self-diagnostic tool allows you to quickly pinpoint the root causes of your problems, learn from your mistakes, and adapt your behaviors to achieve your goals, both personal and professional. An overwhelming body of research has demonstrated that meditation significantly enhances mindfulness, and that mindfulness can directly alleviate suffering in our lives (e.g., the many studies from Jon Kabat-Zinn and R.J. Davidson). Mindfulness can be characterized as the ability to self-regulate one’s attention to focus on the present moment with curiosity, openness and acceptance. The ability to pay attention to the present moment includes self-awareness — the ability to observe and monitor your thoughts, feelings and sensations as they are happening and to be in touch with your actual felt You can think of mindfulness as nonjudgmental awareness, focusing on the present moment without the stress of judging it. Mindfulness is the feeling of being fully present and alive in the moment and accepting each thought, feeling and sensation that arises as it is. Mindfulness allows us to observe our thoughts and feelings merely as events in our minds, without over-identifying with them or reacting to them automatically or habitually. This calm, dispassionate state of self-observation inserts, in essence, a “space” between our perceptions and our responses. That open space allows us to respond to situations reflectively, rather than reflexively. Mindfulness during meditation does not directly address the content of thought; rather, it changes our relationship to our thoughts. In the business world, a relentless focus on productivity and accomplishment — especially when the ego engages — can actually foster mindlessness rather than mindfulness. We all have beliefs, attitudes, memories, impulses and biases that can control our thinking and prevent us from being mindful. This information flow is sometimes referred to as top-down processing, in which analysis begins with the brain and flows downward, filtering incoming information through our experiences and expectations to ultimately produce perceptions which may or may not represent reality. (In bottom-up processing, information flows from our sensory receptors upward to the brain, unfiltered by experience and expectation.) People who commit inconsiderate, “mindless” acts — whether it’s rudeness in rush hour traffic or mass destruction such as war or genocide — are allowing themselves to be controlled by top-down forces that prevent them from considering how their actions will impact others. Such mindlessness can cause us to act on destructive ideas or impulses without considering the greater good. Sahaja meditation helps you master your emotions, which means you’ll be better equipped to focus and solve problems, rather than waste time feeling inadequate and guilty about your mistakes or poor performance and reflecting on what “might have been.” You’ll learn to live in the present, rather than dwelling on the past (common in depression), or worrying about the future (common in anxiety). Experienced meditators develop a new “Idle Mode” (e.g., during downtime or daydreaming) that’s more present-centered and less self-centered, which leads to better mental health. Meditation functions as an emotional regulator, producing lasting changes through, primarily, two mechanisms: attentional control (by controlling what we pay attention to) and cognitive control (by exercising conscious control over our thoughts and feelings). Meditation teaches us to view thoughts simply as events in the mind, independent of their content and emotional charge. We are able to detach emotion from thought and pay nonjudgmental, nonreactive attention to all aspects of our experience, which reduces emotional reactivity and helps develop a mature emotional perspective of how to manage our daily professional lives. A large 3-year UK study found that Sahaja meditation’s state of thoughtless awareness had a more significant impact on decision­-making, social consciousness, cognitive and emotional capacities, and perception than traditional executive education training and relaxation yoga (Zollo, M., Berchicci, V., 2007). Researchers found that the practice of deep introspection meditation, even without any mention of CSR concepts, can shift psychological traits and personal values towards higher social consciousness, which increased the odds that socially responsible behavior would emerge spontaneously and diffusely throughout the organization on a day-to-day basis. Sahaja meditation was found to shift executives’ decision-making priorities, increasing the likelihood of doing good, rather than just doing no harm. Meditation stimulated positive mental and physical changes and enhanced the managers’ sense of overall well-being. Happiness, self-confidence, inspiration, and feelings of authenticity increased. Anger, self-dissatisfaction, nervousness and sadness decreased. The overall stress and anxiety level of the Sahaja meditators showed a strong decrease. Sahaja meditation was found to stimulate growth toward self­-transcendence, which included behaviors such as striving for self-improvement, increased openness to change, and developing a broader, more evolved sense of self. Enhanced qualities included: increased responsibility; increased inner harmony; increased wisdom and decreased superficiality (e.g., concern for preserving one’s public image). Sahaja meditation motivates you to increase productivity and transcend past performance. You begin to look inward for answers, and by focusing on your own strengths and weaknesses, are directed towards constructive ideas and real, productive output rather than getting caught up in corporate politics or unhealthy competitions. You don’t fall prey to professional jealousy or the need to constantly compare yourself to others. You don’t waste time and energy trying to outdo everybody else or manipulate circumstances to make others look less effective than you. Meditation, over time, can have a significant impact on your personal evolution and maturity. You become more focused on offering tangible value and contributing to achievement of the organization’s goals. You’re not one of those high maintenance employees, the constant complainer who is constantly seeking raises, promotions, or better working conditions. And because Sahaja enhances creativity, focus, and problem-solving skills, your decision-making ability and overall performance is greatly enhanced. Your ability to think clearly and “think on your feet” improves. EI is the ability to identify, understand and manage emotions, and use them constructively to facilitate thought and drive behavior. Improved self-awareness improves self-confidence, which is your belief in your abilities within a particular realm of expertise (e.g., financial analysis). EI shapes our understanding of ourselves and our interactions with others. It defines how and what we learn from our experiences and helps us set priorities. It determines whether you’re a good team player who can collaborate well with other colleagues. It helps you channel your feelings and impulses purposefully, keep your goals in mind, and pursue those goals with energy and persistence. You develop the capacity to focus your emotions on a desired goal and delay gratification when it’s necessary to serve a greater, long-term goal. The practice of Sahaja also helps you become more aware of how your actions impact others. Your own internal process of self-realization increases your compassion for, and sensitivity to, others and improves your communication skills and empathy for others, which improves your relationships. Your analytical skills and ability to analyze and problems and find creative solutions is enhanced. Relationship skills improve, which strengthens conflict resolution skills and makes relationship-building with peers, customers and supervisors easier. You become a better team player. And you are better able to ignite the spirit of good teamwork in others, which enhances the entire team’s productivity. Even those who have difficulty building relationships, or those accustomed to working alone, ultimately find it easier and more fulfilling to work with a team. Meditation makes us more self-reliant. We don’t need to depend on others to feed our self-respect or provide proof of our worth. Meditation allows us to process how we feel about ourselves objectively, rather than through preconditioned biases or beliefs. Our thoughts are not filtered through negative, immature, or egoistic filters. Sahaja’s state of thoughtless awareness may allow implicit, subconscious self-appraisals to become incorporated into our conscious experience of ourselves without judgment, which ultimately promotes secure high self-esteem. Sahaja meditation nourishes the heart energy center (Anahata), which increases self-esteem by strengthening our sense of security about ourselves. The energy center at the center of the forehead (Agnya) plays a big role in monitoring and regulating the ego. The regular practice of spiritual meditation can improve character and personality traits over time, ultimately increasing your level of self-respect. When we can maintain high levels of self-respect, we develop a deep reservoir of secure self-esteem. 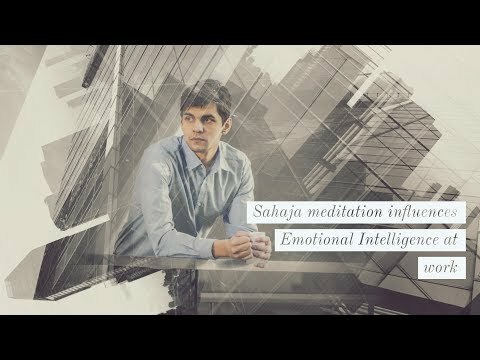 Sahaja meditation helps instills contentment and happiness from within and promotes optimism and positive thinking, which helps build an inner confidence that you will be successful at work and banish distracting, self-damaging fears and anxiety, such as a fear of unknown or unpredictable results. You’re better able to manage change dynamically and confidently. You develop confidence in your skills and abilities, so, for example, it becomes much easier to confidently and persuasively make presentations to an audience. And freeing your mind from stressful thoughts through meditation frees more of your energy to enjoy your work, as well as all the other good things that life has to offer. Stress interferes with productivity, decision-making and professional relationships. One Australian workplace study comparing the impact of Sahaja meditation’s state of thoughtless awareness and a relaxation model of meditation on work-related stress, anxiety and mood found that Sahaja was the most effective approach for relieving occupational stress and improving workplace health (Manocha, R., et al, 2011). In relieving occupational stress, Sahaja meditation reduces the likelihood of “tunnel vision.” High occupational stress levels tend to foster tunnel vision, which makes us more likely to: 1) Focus on satisfying short-term needs and reach for short-term solutions; 2) Avoid seeking innovative solutions, narrow our search to known territory and habits; 3) Seek immediate satisfaction of our own self-interests rather than considering the interests of others. Sahaja meditation acts as a stress buffer, helping you manage stress, take control of your life, and sustain robust health and self-reliance. Regular meditation activates a built-in stress management mechanism that helps your cope with stressors on an ongoing basis, enhancing long-term resilience. Resilience conquers obstacles that keep you from doing your best work. Freeing your mind from stressful thoughts through meditation frees more of your energy to enjoy your work and strive for even greater accomplishment. When thoughtless awareness is experienced on a daily basis, it can enhance creativity, problem-solving ability and productivity by relieving stress and increasing energy levels. Performed continuously over months or years, meditation may ultimately make work seem like vacation by giving the practitioner a built-in, long-term strategy for managing stressors. You become better at managing environmental stressors in demanding, high-pressure environments. Sahaja meditation enhances our ability to live a self-actualized life. Self-actualization can be described as the higher human quest to be creative, to grow, to acquire knowledge, to develop our abilities and fulfill our potential. It is the process of actualizing one’s potentialities at any time, in any amount. In self-actualizing moments, we are experiencing our work fully, vividly, selflessly, with full concentration and total absorption. Meditation helps us lean toward making growth choices instead of fear choices. We develop an authentic self, and strive, from our very core, towards growth. Meditation helps inspire what Abraham Maslow referred to as peak experiences, one of the most important aspects of self-actualization. Theseexperiences are moments of ecstasy, harmony, awe, wonder, and a sense of limitless horizons, followed by the understanding that the experience had deep meaning that could be applied to everyday life. They are what we think of as “the epiphany,” those luminous moments during which we have a sense of oneness with the universe. (Choosing to do work that you love helps foster those moments!) The practice of Sahaja can enhance clarity and focus and help pave the path to becoming the person you aspire to be — personally, professionally, and relationally. In other words, Sahaja both makes us aware of our higher level needs and helps empower us to achieve them.